Grinnell College's Office of Development and Alumni Relations can’t wait for you to grab your helmet, get on your bike, and have an amazing RAGBRAI (Register's Annual Great Bicycle Ride Across Iowa) adventure with other Grinnellians. Grinnell College hosts a happy hour, 3 days of a "meet up tent", and our annual RAGBRAI dinner. This year's dinner will be hosted in Fairfield on July 25. 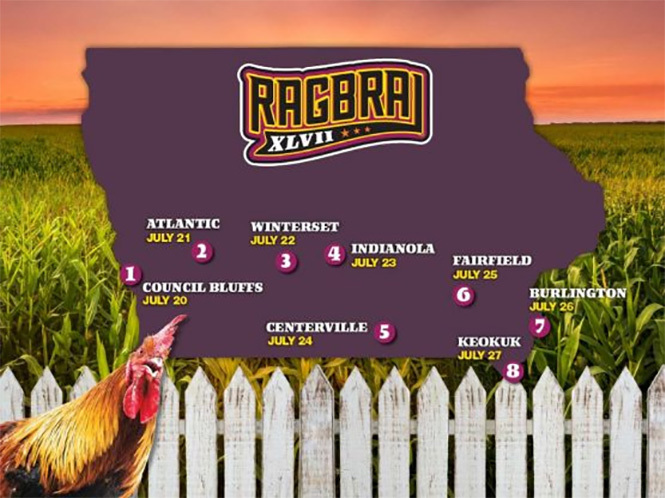 Registration for the RAGBRAI dinner will open in May. Come to celebrate RAGBRAI with your favorite Grinnellians. If you have any questions, please email Molly Campe '96, senior associate director of alumni and donor relations.